The Republican tax cut details are here. House Committee on Way and Means Chairman Kevin Brady and Speaker of the House Paul Ryan talkin’ taxes at the Capitol on Thursday. Republicans have finally released actual details of their long-awaited tax cut/reform plan! The good news is that they’re cutting taxes for everyone and it’s gonna be great. The bad news is that since independent analysts haven’t weighed in yet I’m basing that previous sentence entirely on the GOP’s commentary on its own ideas. A big change may be in store for those who deduct medical expenses. 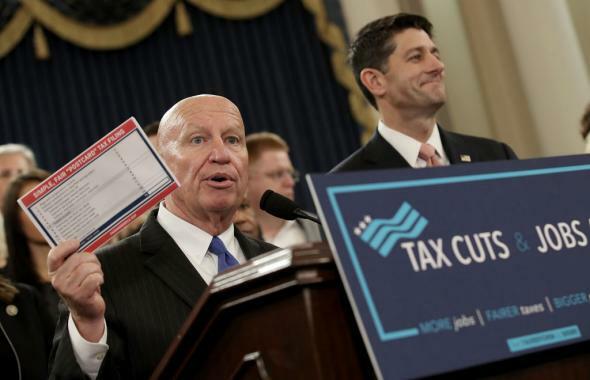 The talking points outlined by Republicans say the deduction will go away but that families will be made whole by the overall lowering of tax rates and doubling the standard deduction. They’ve got it all under control! Let’s pass this thing!